This is basically a contemporary concept program. Pereira has elicited works for solo cello from numerous Australian composers on the subject of a fascinating rock dominating an otherwise flat desert in Central Australia. This location (I gather from various hints in the liner notes) has been given back to the aborigines to manage, making it a subject concerning race relations as well as an impressive landmark. The 12 composers handle their assignments in different ways, though there is a general tendency toward wide-open spaces, abstract harmonies and a sort of improvised feeling. Notable exceptions to this generalization are Ross Edwards's 2-minute virtuoso opener and Martin Wesley-Smith's song, actually sung by the cellist while playing his own accompaniment. Roger Frampton's chromatic but tonally oriented Meditation and rhythmically catchy Celebration and Anne Boyd's similar pair follow a path from sadness to rejoicing. Pereira's own piece makes excellent use of the instrument's sonorous possibilities. Roger Dean's, on the other hand, pushes the envelope to the point where the cellist sounds sometimes at a loss as to how to make the notes clear. Sarah Hopkins's is totally a sound piece and none the worse for that. Mike Nock's work occasionally passes Pereira's comfort zone, but is an atmospheric composition of some character. The program ends with a short piece by the dean of Australian composers, Peter Sculthorpe, less technically ambitious than some, better than most in evoking the grandeur and underlying beauty of its subject. This is a project of considerable scope, effectively carried out. The market for serious Australlan music doesn't exactly rival that for Britney Spears, say, or the Three Tenors and their ilk. Nevertheless, the Tall Poppies label has laboured in this boutique vineyard for a decade, giving a voice to many Australian performers and composers who mlght otherwise have languished. If that sounds a bit worthy, Uluru will dispel such thoughts. 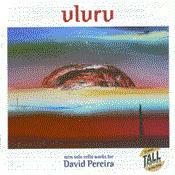 The wonderful David Pereira plays 14 brief works composed by a dozen of the best - Rosss Edwards. EIena Kats-Chernln. Martln Wesley-Smith, Colin Bright, Tristram Cary and so on, ending with the benign godfather of Oz music, Peter Sculthorpe. This dlsparate lot sounds as If they were all inspired equally powerfully by Uluru and its environs, Themed discs can be gimmicky and plecemeal, usually with some duds on board. Not so here, where the music seems so heartfelt and the playing so responsive to those feelings that an atmosphere of unity and completeness prevails. Apart trom the didgeridoo there can be no more apt instrument to evoke the rock than the cello, and Pereira can make the latter sound very much like the former. But there are too many riches to enumerate; let’s just say Uluru is a flne choice to mark TaII Poppies’ 10th birthday, ceIebrated with the launch of this disc at a party today. This is Pereira’s second recital disc and follows on from his hugely successful CD single of Carl Vine’s cello and tape piece Inner World. Pereira is a singing player with a strong personality who doesn’t have much time for modernist extended techniques. Through Mike Nock and Roger Frampton, he’s drawn on composers with a background in jazz and this suggests a musician who’s looking beyond the usual confines of ‘contemporary music’ for an audience. But what are the pieces actually like? Some aren’t bad. The folksy lyricism of Ross Edwards’ Laughing Rock sets the tone, doing what it has to concisely. But someone less charitable than I might be tempted to say that Pereira has commissioned twelve versions of the same piece. The likes of Martin Wesley-Smith, Anne Boyd and the ubiqitous Peter Sculthorpe largely take it easy with a particular brand of decorative pastoralism expressed through unimaginatively idiomatic passagework and hammy tunes. Pereira brings warmth to these scores but their ‘house’ style becomes wearing. They should take a lesson from Elena Kats-Chernin’s taut and highly original Wild Rice. Starting in the stratosphere, Pereira plays Kats-Chernin’s oblique melodies with dramatic panache. He exaggerates the work’s patchwork structure to telling effect, and the climax involving paragraphs of rapid slap pizz notes is shattering. It’s the best thing here by a long way.